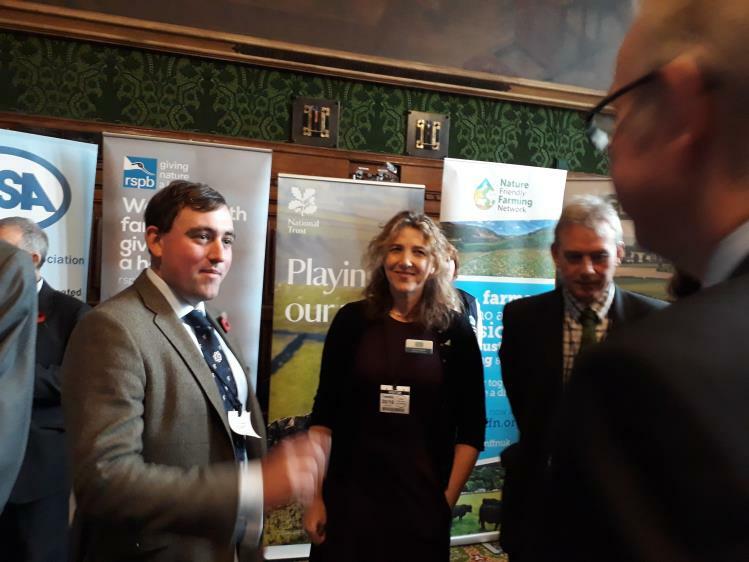 NFYFC joined forces with farmers, landowners and environmental groups to bring a united message to Parliament, on 30 October, calling for the Government to commit to long-term funding for the policies detailed in the new Agriculture Bill. David Goodwin from Warwickshire FYFC and Vice Chair of NFYFC's AGRI Steering Group attended the event to represent YFC members' views. "We've had a very positive day as part of a collaborative lobbying approach for long-term and sustainable conditions for our farming future," said David. "It's widely recognised by industry and policy makers that young farmers play an essential role in the future of the industry. Both the Secretary of State and our farming minister recognise the part we can play in a future agricultural environment and the financial measures needed to support this." While the groups each seek independent amendments to the Agriculture Bill more widely, they are united in their advocacy that a commitment to long-term funding is crucial to achieving the Government’s ambitions of feeding the nation with high quality food alongside delivering environmental benefits. The organisations jointly hosted a drop-in event in Parliament to present this message to MPs and Peers. Alongside NFYFC were the Agricultural Industries Confederation, CLA (Country Land and Business Association), National Farmers Union, National Sheep Association, Nature Friendly Farming Network, Soil Association, Tenant Farmers Association, and Greener UK which represents a coalition of 13 major environmental organisations including National Trust, RSPB, Woodland Trust, WWF and The Wildlife Trusts. Defra Secretary Michael Gove was urged to support the organisations’ unified bid for the Agriculture Bill to establish a long term multi-annual budgetary framework, that delivers certainty for the rural economy and farming. Below is a view from each organisation that was involved in the mass lobby event. Good land management, and profitable farming delivering a healthy environment requires long-term planning. The CLA fully supports Government’s aspirations for a productive farming sector that also provides a range of public goods for society, but politicians must recognise that delivery of new policies in the Agriculture Bill will require change and investment by farms and landowners. Greater certainty on longer-term funding intentions will help provide the confidence needed to make these changes. Young farmers envisage a progressive, dynamic exporting industry that offers attractive and viable career routes for young people. To help make this vision a reality we need to be able to plan and invest in our future. We need long-term political financial certainty to ensure that our intended long-term investment is a realistic option. We want, and need, the Agriculture Bill to establish a multi-annual budgetary framework to provide that certainty and viability for the next generation. There is a much-heightened awareness of the important role that trees play in society and of the need to significantly increase planting rates in this country. The Woodland Trust wishes to see a far more integrated approach to land management that enables the many benefits of trees at a variety of scales – from larger scale planting to smaller agro-forestry initiatives – to be realised for the benefit of society. It therefore broadly welcomes the Agriculture Bill and particularly its move towards the payment of public money for public goods. It is essential however if the Bill is to fulfil its potential - and we are to achieve the increase in tree cover that enjoys such strong cross-party support – that the Bill is amended to provide a long-term funding mechanism. Land managers need to have confidence in the new system that sufficient support will be forthcoming to back them in delivering key public goods like more resilient and biodiverse habitats, flood alleviation and healthy soils. Whilst not on the face of the Bill itself, the NFU welcomes the government’s commitment to maintain cash total for farm support funding until the end of this Parliament (expected in 2022, but possibly sooner). Longer term we believe that the current levels of public investment in agriculture should be maintained. We believe that the Agriculture Bill should establish a multi-annual budgetary framework that provides certainty for famers and allows them to plan and invest for the future, under clause 33 (Financial Provision). Budgetary cycles should be independent of the parliamentary cycle to reflect the need for long term planning and investment and to avoid the agricultural budget becoming politicised and subject to annual discretionary spending decisions. There should be scope within the Bill for minsters to “carry over” any monies left unspent at the end of a particular budget year for spending in subsequent years. The National Trust cares for a quarter of million hectares of land in England, Wales and Northern Ireland and has 1,800 agricultural tenancies. Along with other organisations in the Greener UK coalition, we believe the Agriculture Bill should place a duty on Ministers to set long term, multi-annual budgets that reflect the scale of financial need associated with the Government’s policy objectives. The Bill should also specify the timeframe over which these budgets would be set, and provide a means by which funding would be allocated between the four countries of the UK. If the government wants farmers to get on board with its new system of land management – where land managers are paid to deliver the public goods that underpin sustainable, long term food production - it must provide the certainty and security of long-term funding, backed by first class and first-hand advisory services which are properly resourced. Creating a domestic agricultural policy for the first time since the 1970s is a significant opportunity. Linking with the Government’s 25-year plan for the environment, we have a unique platform to build long-term resilience and sustainability for farm businesses, the wider rural economy and the landscape and biodiversity supported within the farmed environment. For 40 years we have relied upon the budget arising under the European Union’s Common Agricultural Policy with its own multiannual budget over 5 to 7-year periods. As we leave the EU and create our own policy we must maintain the discipline of planning public expenditure within a multi-annual, budgetary process. We welcome the commitment to maintain the budget within agriculture until the end of the Parliament, but it is essential that thereafter there is a robust, multiannual budgeting process to give farming the confidence to invest in productivity and the production of non-market public goods. The RSPB welcomes the Government’s intention in the Agriculture Bill to use public money to secure public goods, but these often take years to realise. For example, restoring peatland habitats to provide clean drinking water, carbon storage and reduce flood risk for communities can take fifty decades. And as a long-term industry, farmers need certainty over the funding available if they are to engage in a future policy with confidence. At present, the Agriculture Bill is silent on this key issue. To provide confidence in the Government’s proposed reforms, the Bill must include a mechanism that secures long-term funding for farmers and land managers so that they have sufficient support to deliver the public goods we all depend upon. This amendment should provide certainty about the timescale over which funding will be available, and require an independent assessment of the funding needed to secure the objectives of the Bill. The Wildlife Trusts believe that nature is vital to our long-term economic prosperity and our individual wellbeing, but the natural world is in decline. Urgent action is required - and agriculture policy is vital to this. The Agriculture Bill represents a unique opportunity to put in place the measures needed to support nature’s recovery. It should ensure that substantial government funds are allocated to the creation of new and expanded habitats for wildlife with appropriate provision of public access. Crucial to the success of the Government’s proposed new Environmental Land Management Schemes will be guaranteed long-term funding, set at the level required to deliver its ambition to leave the environment in a better state for the next generation. The Agricultural Industries Confederation is a member of the Agri-Brexit Coalition - 8 trade associations supplying goods and services to UK farmers. We have a mutually-dependent relationship with UK farmers. They rely upon the skills and knowledge of trained advisers, technicians, technologists and researchers, plus the commercial expertise of our members. The necessary investment, recruitment, training and ongoing development of these people will only continue if commercial organisations are assured of an ongoing income stream to justify this. The same applies to investment in physical facilities. Seed processing plants, port facilities, agricultural machinery manufacturing, production of animal health and plant protection products – all require commercial certainty for companies to feel confident in making medium and long term investments. The benefits of planned investment in UK Agriculture plc are obvious but crucially must be underpinned by concrete economic assurances that UK farmers and farming will remain viable. WWF want to see productive agricultural systems that improve the health of soils and rivers, help tackle climate change, and conserve and enhance habitats and species. The Bill is the most significant legislation on agriculture in almost 50 years and with over 70% of the country being farmland, its implementation will greatly affect the future of landscapes across all the nations of the UK. The Bill and accompanying Policy Statement can only be realised however, with committed long-term sustainable funding. NSA represents sheep farmers from across the country. Our concern is that the sheep sector is going to be one of the hardest hit by our exit from our exit from the EU both in terms of trade and the Agriculture Bill. Sheep farmers need the stability of a long-term funding commitment. Their business decisions are long term endeavours and the decisions they make will be informed by stability they can see. NSA would like the treasury to commit a long-term budget to accompany the Bill, which stands regardless of the political, economic and environmental turbulence and ever-changing Governments. Sheep farmers play a huge role in providing public goods. Where it comes to providing landscapes and environmental features for the public good, the work that farmers put in will lead to long term and permanent changes. Farmers will require committed and long-term funding to support these changes, they should not run the risk of losing support according to political changes. For more on the Agriculture Bill, visit here.